Picture this: You’re standing in line at the store. There’s only two people in front of you but the cashier is sure taking her time. You’re faced with at least a 3 minute wait. You look around and notice the collection of tabloids is surprisingly boring today – nothing there to catch your interest. Ah, you think, no problem. And you……do what? If you’re anything like me, you find yourself grabbing your phone anytime there’s an anticipated break of more than 30 seconds. It’s almost a reflex. Waiting for an elevator? Grab the phone. Waiting for someone to show up? Grab the phone. Waiting for my lunch to heat up in the microwave? Grab the phone. And what’s more, this “grab the phone” habit is becoming highly addictive. Every spare minute is being filled with – nothing, really. Just looking around to see what I can look at. This “grab the phone” habit is becoming highly addictive. This is not a new problem. I actually wrote about this last year (in this article here), but despite my best efforts, it seemed to be getting worse, not better. Until I started noticing the side effects and decided enough was enough. Y’see, constantly reaching for our phones doesn’t seem like a big deal. Sure, it makes some great fodder for comedy, and we get a little annoyed when our spouses or kids do it, but really, not that big of a deal, right? Um, no. It’s a big deal. Attention from my family. I’m not even noticing my kids when my nose is buried in my phone. I am missing way too many opportunities to enjoy them, guide them, and interact with them. Same thing with my husband….when we’re both sitting there on our devices, we’re not connecting much, now are we? Blank space to think. We need empty space in our lives. When something (music, podcast, radio, TV) is always on, or we’re always looking at a screen, we have not space left to think. To decompress. To simply pause and look around. My productivity. It’s amazing how much more you get done when you’re not stopping to look at your phone every 3 minutes. Quiet time to hear from God. Most importantly, I realized I was leaving no quiet space in my life to hear from God. How could I possibly hear that still, small voice when I was constantly filling my life with noise? Along the same time I was coming to this realization I read the book 7 by Jen Hatmaker. (fantastic book, by the way – super thought-provoking.) In this book, Jen gives up (amongst other things) all media for a month. Frustrated by my own struggles and inspired by Jen, I determined to take the majority of my apps and put them in a folder for a week. And, I have to say, it wasn’t as hard as I thought it would be. Yes, it was hard, but it also felt good. Really good. The reality, though, is that we live in a very technology-driven world. We can’t always turn our phones off for weeks on end. But we have to find balance in this area. Since then, I’ve tried all kinds of ways of achieving that balance. And while I’m making progress, I definitely haven’t figured it out yet. What I’m hoping, though, is that this conversation will inspire you to start (or continue) your journey towards balance. Turn off 95% of your notifications. Notifications are the worst! They grab our attention and scream “I’m more important than the conversation you’re having right now!” But they lie. They are not that important – certainly not so important that they can’t wait 10 minutes. So turn them off. Leave only the most important apps that you want to give permission to interrupt you. Do a fast. Take a specific amount of time – a day, a week, a month – and severely limit your phone use. The point is to jump-start your journey & help yourself realize just how addicted you really are, how full your mind has been, and how great it feels to get some empty space in your life. Put your most distracting apps in a folder. You know those apps that you use the most & that waste the most time? The ones that are on your main screen? Take those – yes those precious favorites – and put them in a folder in the back of your phone. Make them hard to get to. Name the folder something that will make you feel guilty like “time-wasters.” The point is to force yourself to work a little hard (& hopefully think twice) before you run to them. Declare no-phone or no-app hours. Pick a time when you’re normally glued to your phone and declare that your “no-phone” time. Or, if you still want to use your phone, just make that certain folder off limits (see suggestion #4). My no-app hours are between 8am and 11am. During that time, I try (I really do try) to treat my phone like a dumb phone – texting & talking only. I’m not really that great at it, but I have to say that I use my phone WAY less than I used to, and I’m actually enjoying the morning with my kids. Declare a no-phone or no-app day. Similar to #5 except you pick a day each week where you – to the best of your ability – ignore your phone. Set a limit for how often you can go in your “time-wasters” folder. This, my newest addition to my “break the addition” plan, is helping me make some real progress. I can go in my “time-wasters” folder (which includes such goodies as Facebook, Pinterest, Instagram, and email) only 5 times a day. This makes me think twice before I grab my phone & start surfing around. Confession: I still grab my phone. I look at it longingly, open a few boring apps that are outside the folder, remember the whole point is to not be looking at this phone, and (somewhat sadly) put it back in my pocket. But I’m doing it less. And I think this is gonna’ pay off in the long run. The surprising thing is that, despite the challenge, all of this actually feels really, really good. Yes, I miss my apps sometimes, but having that empty space is great. The other day I actually watched some kids skateboard while my husband pumped gas. Way more entertaining than LogicSquare! So what about you? You ready to clear some space in your life? 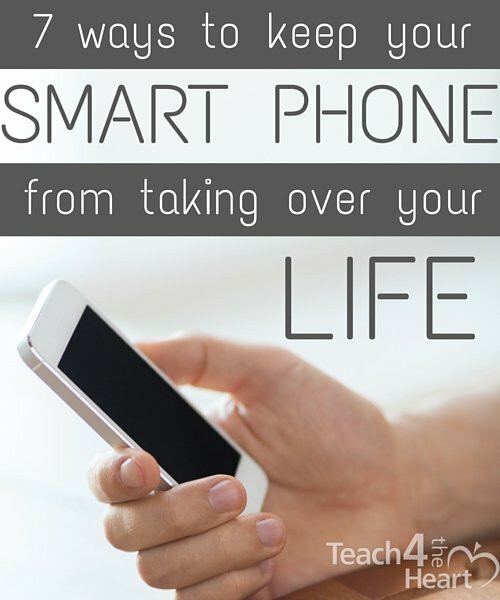 What do you do to keep your smart phone from taking over your life? i agree with yours ideas . This is a struggle of mine, too. I think staying home with my preschooler and five month old all day makes it a bigger temptation because, even though I’m constantly busy, my mind isn’t necessarily busy while watching them. I love the idea of no-phone hours. I want to incorporate some other boundaries for myself as well! Today, as a matter of fact, I turned my phone off in the morning as I disconnected the charger. I had planned on turning it back on, but I thought, “Why not see how long I can go without it?” So far, so good. Although, it’s only been a few hours. I am also considering not checking my email until the end of the day–just for today–to see how things go. If all goes well, I might establish some sort of routine. Thanks for sharing your suggestions. I’ve found when I’ve had a really serious habit, I did have to quit cold turkey. Weaning myself slowly only prolonged things.